U3 platform is a technology created for Microsoft Windows operating systems that allows applications to be executed directly from a specially formatted USB flash drive according to U3 specifications, which also U3 smart drives, so that data and programs can be shared on multiple PCs. Some examples of U3 smart drives are Kingston U3 DataTraveler, SanDisk Cruzer Micro, SanDisk Cruzer Titanium, Verbatim Store ‘n’ Go U3 Smart Drive, Ativa U3 USB 2.0 Flash Drive, Geek Squad USB 2.0 Flash Drive, Intuix Smart Drive M300 U3, Intuix Smart Drive S300 U3, busbi USB Flash Drive, disgo classic, disgo diva, disgo dude, disgo lite, Disk2go SMART II, Extrememory U3 smart USB Drive, Hama U3 FlashPen Mini USB 2.0, Memorex Mini TravelDrive U, PQI Cool Drive U320 Smart Drive, TwinMos U3 Mobile Disk, Elecom MF-UU2 and i-o data EasyDisk U3 smart drive. U3 smart drives come preinstalled with the U3 Launchpad which emulates the Windows OS start menu, and controls program installation and hence facilitate the portability of software. However, if you would like to use the USB flash drive or memory key as a pure normal USB mass storage device, or you don’t use operating system that U3 supports (i.e Windows XP and Windows 2000 operating systems), or you simply feel that U3 Launchpad and applications have bugs such as unable to eject due to locked files in use, consent on privacy and automatic installation of U3 software and pop-up etc, you can uninstall and remove the U3 Launchpad from the USB storage device. To remove and delete the U3 Launchpad, you need to download U3 Launchpad uninstallers or U3 Launchpad Removal Tool that remove the U3 Launchpad and re-configure the USB drive to be a single mass storage USB drive. 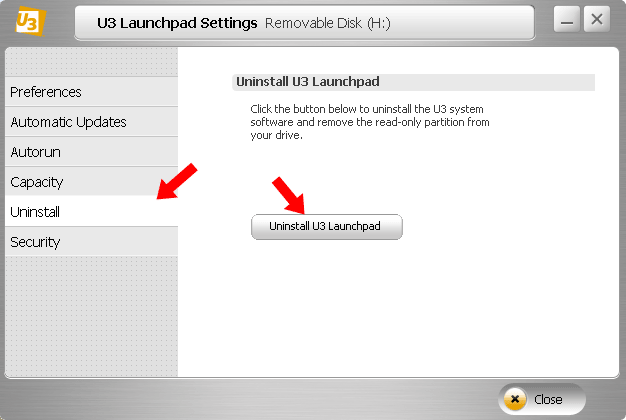 Currently, U3 Launchpad uninstallers are only available for and must be run on Windows XP or Windows 2000 machine. When uninstalling, the U3 smart drives USB device has to be plugged in with U3 Launchpad running. Note: If you have other U3 smart drives which is not supported by the removal tool above, try the U3_Tool. U3 Launchpad removal is irreversible. You won’t be able to install U3 again. Beside, backup your data before begin uninstallation process as ALL data will be erased. Despite the warning above, some manufacturers do provide a way to reinstall U3 LaunchPad. In newer version of U3 Launchpad, the option to uninstall U3 Launchpad is also available from the Settings. To access the Settings, insert the U3 flash drive to the PC’s USB port, then click on Settings -> U3 Launchpad Settings in U3 icon menu on the system tray. Then, select Uninstall on the left panel, and then click on the Uninstall U3 Launchpad button on the right. Choose whether you want to restore your files after removing U3 or discard all files, and click Format to start the removal process. If you’re plugging in the U3 flash drive for the first time, and have decided to disable the support of U3 Launchpad, you can also uninstall U3 during initial setup. 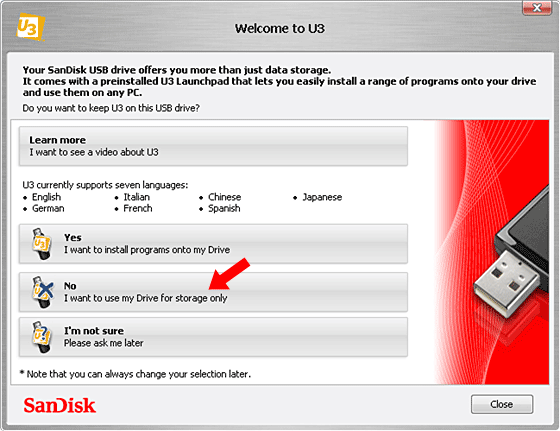 In the “Welcome to U3” window, choose No (I want to use my Drive for storage only). Then, click the Remove U3 button to start the uninstallation.